In entertaining-and unsparing-fashion, this book sparkles with Reds highlights, lowlights, wonderful and wacky memories, legends and goats, the famous and the infamous. 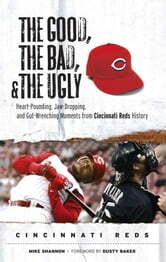 You'll relive the Big Red Machine's World Series crown in 1975 but also horrendous moments such as the disastrous 1982 season. The opening of beautiful Great American Ballpark in 2003 but also the infamous Pete Rose gambling scandal that rocked the Queen City. The Good, the Bad, & the Ugly: Cincinnati Reds includes the best and worst Reds teams and players of all time, the most clutch performances and performers, the biggest choke jobs and chokers, great comebacks and blown leads, plus overrated and underrated Reds players and coaches. There are Reds you loved for all the right reasons, and those you couldn't stand, sublime and embarrassing records, and trades, both savvy and savagely bad. Brawls and fights. Rivalries. Compelling photos. And much more.